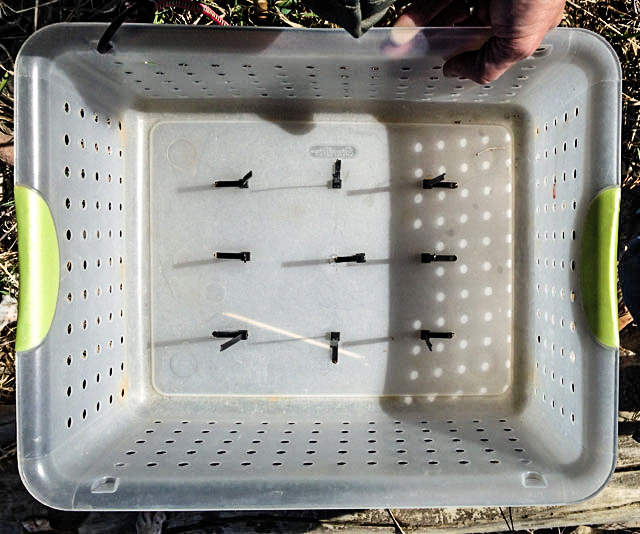 This great little DIY stripping basket idea came from my friend Paul Prentiss and my local fly shop, Front Range Anglers. I see Paul infrequently at my local bass haunt and he’s always got this homemade stripping basket with him. We fish from a sharply angled rock dam that’s covered with weeds, bushes and tall grass so having a place to pile all your loose line when walking around is a must. Here’s what makes this basket so ingenious in my opinion. One, it’s simple, as the pieces can be bought almost anywhere. It’s fastened with one bungee cord around the waist via two holes drilled on either side of the plastic box. Two, it’s cheap and consists of what basically amounts to a small piece of Tupperware/small laundry basket and a few zip ties. Three, it’s packable—and this is the point of construction that’s so brilliant. If you notice the bottom has nine holes drilled into it and zip-ties looped through and cut off about halfway down. This keeps your line from getting tangled when you cast. Here’s the cool part: when Paul travels to fish he simply cuts the zip-ties off, puts the Tupperware in his suitcase, fills it up with whatever and when he gets to his destination reinserts new zip-ties and is ready to fish.